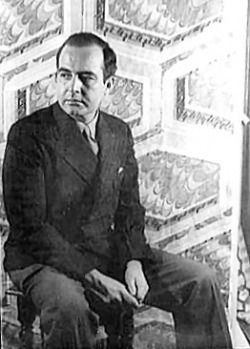 A widely adored mainstream American composer, Samuel Barber worked throughout his life with Gian Carlo Menotti, an Italian composer and Barber's life companion. Though Barber's 1958 opera Vanessa was awarded a Pulitzer Prize, the European critics disemboweled the opera when it opened in Europe. These feelings eventually trickled over to the United States, and Vanessa faded away. It is difficult now to understand what about the opera that was found so objectionable. Despite the near-disappearance of this opera, Barber is most known for his 1966 spectacular failure Antony and Cleopatra which, Barber always felt, contained his best work. Place: Vanessa's country house in a northern country. Vanessa, Erika, and the baroness await Anatol's arrival. Vanessa and Anatol were lovers twenty years before. She refuses to reveal her face until he says he still loves her. He does, but she does not recognize him. It is Anatol's son who has come. His father is dead. Erika and Anatol now enjoy the meal meant for Vanessa and his father. The baroness scolds Erika after Anatol seduces her. Erika loves him, but resists his marriage proposal because she doubts his sincerity. Vanessa tells her niece that she also loves Anatol, despite Erika's warning that he is not her former lover. The baroness tells Erika to fight for Anatol. She is unsure if he is worthy of her efforts. He again proposes, and she again declines. The doctor is drunk at a New Year's Eve ball. The baroness and Erika refuse to come to the party to hear his announcement of Anatol and Vanessa's engagement. The doctor goes to fetch them, while Vanessa tells Anatol her fears. Finally Erika returns, but faints, clutching her stomach, as the doctor makes the announcement. She recovers and flees to the lake as Anatol chases after her. Vanessa is happy when Erika is found alive. She asks Anatol why Erika is acting so strangely. He explains that Erika does not love him. Vanessa begs him to take her away. Erika confesses to the baroness that she was pregnant, but no longer. As Vanessa and Anatol prepare to leave, she asks Erika why she ran away. Erika says she was just being foolish. After the couple leave, Erika covers the mirrors and closes up the house, as Vanessa had done before her.